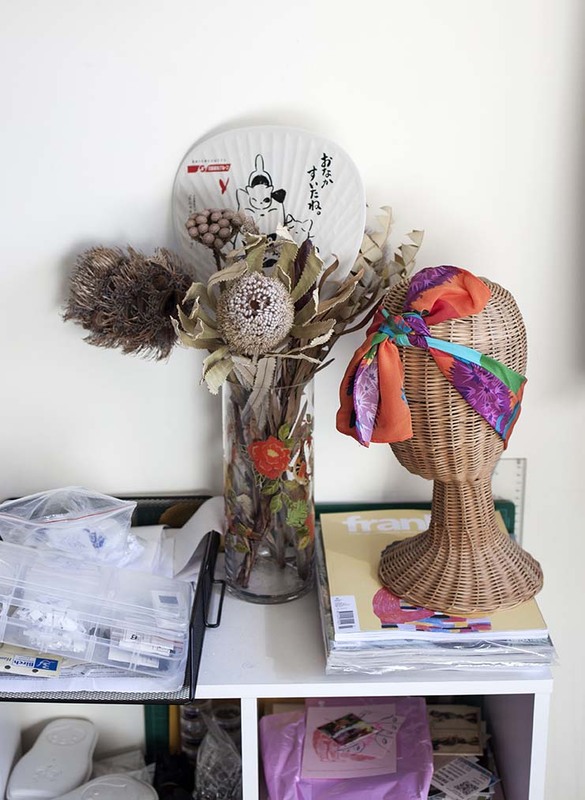 In a retro country cabin hidden away high on Mount Canobolas, Alexis Withers of Alexis Eclectic spends her days surrounded by beautiful fabrics and patterns. Alexis recently moved to Orange from Sydney with her husband. We found out about her relatively new fashion label and how living in regional NSW has shaped her business and design practice. Tell us about your background and how you ended up starting your own fashion label. I was very academic in high school, and went straight into a physics degree at university. I was lucky that my degree was incredible flexible and I was able to do a range of fine art subjects; and then when I finished I continued doing short courses in photography, jewellery making, ceramics and sewing. I was always into styling outfits and vintage fashion, so when I was made redundant from a job, went back to school to learn how to sew properly and make the clothes I wanted to wear. As someone who had an analytical mind, I really feel in love with patterns and the ability to make a 2D design into a 3D construction. When I finished the TAFE course I started Alexis, Eclectic as a way to keep my skills sharp while working in other fields. After working on it on the side for ages, I was lucky to have the opportunity to move to Orange and make it my full-time focus. I see my fashion label as a creative expression, and my background with the arts means I’m always seeking to make more than just things to wear. The Alexis, Eclectic aesthetic is hard for me to pin down. With only two collections under my belt, I almost think it’s too early for me to be able to tell! But I do have some guiding tenants which I stick to when I design, because Alexis, eclectic has always been my reaction to being forced into conservative dress-codes at dull workplaces. My aim is to create statement garments for practical women, and to allow these women to be creative from within the confines of conventional attire. I want to create a label that a diverse range of bodies can wear, that is both ageless and crosses seasonal boundaries. I embrace slow, sustainable, and trendless fashion; the customer knows they’re getting a distinctive garment from a limited edition run. Where do you get your fabrics? Did you design them yourself? 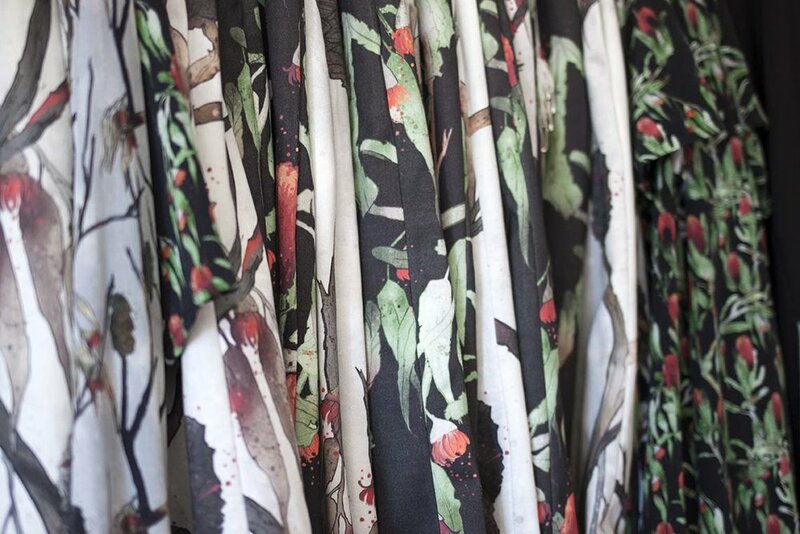 Most of my fabrics are exclusive designs digitally printed on natural fibres, and I work with printers in both Sydney and Melbourne. My current collection’s prints are a collaboration with a close friend and artist, Ayla Meridian. She has such a distinctive digital watercolour style that perfectly created the vision I had for this collection. I really enjoyed the collaborative process and I’m going to do it again, but next collection’s prints I’ve created myself, I’m very excited to have it launch later this year! Normally I begin with two mood boards, one of the shapes and styles for garments I want to make, and another with more colour or print based ideas. I can sit on these for months, editing and thinking, until I start to see a cohesive idea form. The next stage can be chaotic, and sometimes things get dropped and restarted or completely changed, but I generally start drawing up rough designs for both the garments and the prints, trying to express the overarching concept that I want to run though the body of work. When the ideas are concrete I move onto print development and patternmaking, and by this point I’m normally matching the print and garments to the fabrics needed to make them. The final step is to make samples to test my ideas, and finalise the patterns needed to construction. Once these are completed, I pass most of my production to a small company in Sydney, who specialise in high-detail small runs. You recently moved to Orange. How has that changed the way you work? Moving to Orange, and more specifically outside of town in a more secluded location, has been a huge change for me! As someone who has spent their whole life in the city, living within the Australian landscape has been incredibly inspiring. The relative isolation and slower pace of life has also allowed me more time for self-reflection, which in turn has pushed me to be more productive creatively and allowed me to pursue and cultivate new ideas. Having my own studio also means that I’ve been able to make more of the garments myself, which wasn’t something I couldn’t do in my small Sydney apartment!